The dolls that came with the midnight magic hair that hasn't been color changed to ruby red yet are extremly rare. 1966 was the year for the beautiful #1150 Color Magic Barbie doll, who has blue eyes, and came in two different hair colors; golden blonde or midnight. Both versions included a solution to change their haircolors. Golden blonde hair changed to Scarlet Flame and Midnight hair changed to Ruby Red. She has peach, raspberry, or yellow lips. She was on the bend leg body which is the same as the American Girl body. Note: the 1st issue of this girl had the same markings as the Miss Barbie which had the indented markings rather than the raised letters. She also came with a plastic box (1966 only) which could be converted to a closet. Later they were sold in the standard open faced cardboard box (1967). Both are hard to find, with the cardboard being the most rare. She is marked ©1958/Mattel, Inc./U.S. Patented U.S. Pat. Pend Made In Japan. 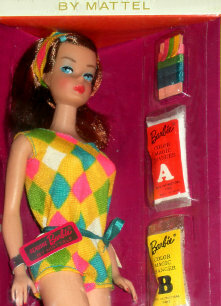 In the box: Barbie in her one-piece diamond print swimsuit, tie belt, matching headband, turquoise bobby pin, and 3 additional colored bobby pins, 4 hair ribbons, blue tulle hair tie, color changer A & B, sponge applicator, and booklet (1967- plastic stand). In 1965 some of the fashion booklets that came out (before the doll did) showed sketches of her dressed in a floral swimsuit. That suit never made it to market! The diamond print suit must have seen more stylish by 1966! #1150 Golden Blonde Color Magic Barbie dressed in #1779 Mix n' Matchers (1967) and Midnight Color Magic dressed in her original swim-suit which could also change colors. Solution A changes the color of Barbie's hair and clothes, and Solution B converts it back.